Importing your existing bookmarks to your Sitebar account is easy. SiteBar can import bookmarks in a variety of formats. In general you need to export your bookmarks first and store them in a file. See a short introduction "How to export Firefox bookmarks" or "How to export IE favorites" if you need help with exporting links from one of these browsers. You have to be logged in to SiteBar to access and manage your online bookmarks. Right click on a SiteBar folder where you want to import your bookmarks. 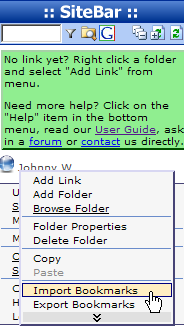 A context menu will be displayed. Select context menu item Import Bookmarks. An Import Bookmarks dialog shown below will be displayed. Target Folder Name - this field is read only, you can verify which folder your bookmarks will be imported into. Bookmark File - browse for the file containing the bookmarks you have exported from your browser earlier. Select Input Format - SiteBar knows how to import bookmarks from various formats. In most cases should Auto detection work just fine. 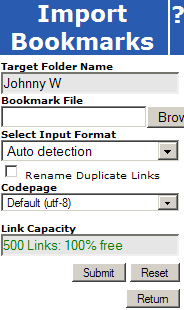 Rename Duplicate Links - leave this check box empty to skip duplicate bookmark names while importing. Codepage - in case you don't know which codepage was used during bookmark export, choose this default option.